We are full time paper money dealers, buyers and collectors. We do most of our business through the mail, so distance is never an issue. 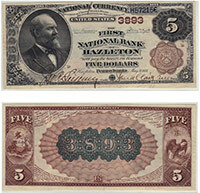 We are the leading buyers of rare bank notes and currency printed by The United States between 1861 and 1929. You can find us set up at most national coin and currency shows. You can contact us 24/7 via email or phone. View our Coin Auctions. We buy from and provide currency appraisals for individuals, estates, banks, and trusts. We also work closely with the leading banknote auctioneer Stacks Bowers Currency Auctions. We are in a position to buy anything worth $100 to $1,000,000. We look forward to working with you. We bought this in September of 2010 for more than $20,000. It is still one of our favorite pieces of rare paper money. What's New At Rare Currency? We recently bought this Abbeville, SC bank note. The condition could be better, but bank notes from small Southern towns are rare.. We paid $2,500. What Makes Currency Rare and Valuable? Condition: We all should know that condition is extremely important when it comes to valuing rare currency. The same thing goes for coin values. For example, an 1886 $5 bill in perfect condition might sell for $30,000. The same note in circulated condition might only be worth $1,000. Number Known To Exist: You generally only see quantities "known to exist" quoted when dealing with very rare type notes or national bank notes. There is a huge price gap between a piece of currency where only one is known to exist, and a note where twenty are known to exist. Popularity with Collectors: Some currency, despite not being especially rare, can be very popular with collectors. This is just known as supply and demand. If collectors want something then it will sell for more money.